Keeping your bird's environment clean should not be overlooked. You can buy safe and effective cleaning sprays for aviaries, cages and equipment at most pet/stockfeed shops. Always compare prices online, shopping around might some you some money! Cages cage trays and feed dishes should be cleaned weekly with a bird safe disinfectant. Rubbing your finger around a bowl is not considered cleaning it. Concentrate should be diluted according to the manufacturer's specifications. Always use a clean new spray bottle, wear personal protection equipment and apply in a well-ventilated area. lutacide is an all-purpose surface disinfectant and cleaner for animal and bird housing. It is effective against a wide range of common contaminant organisms that are harboured in animal environment and housing. The control of these organisms reduces the hazard of disease and creates a clean, odour free environment. Glutacide has a rapid action and remains active for several days on treated surfaces. All animal and bird housing systems may be safety and effectively cleaned and disinfected using Glutacide. Dose: 10mL/1L water. Has residual action and if left in contact with surfaces will remain active for 5-7 days. 20mL/1L may be used in areas with high contaminant build-up. The product is not formulated or intended for use directly on animals or birds, however, but is suitable for all animal contact areas. 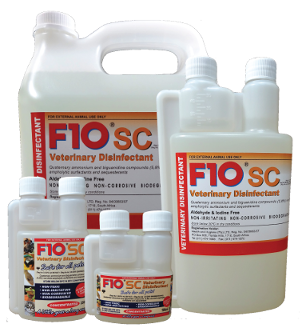 ills all types of pathogen – F10SC is bactericidal, virucidal, fungicidal, sporicidal. Non-corrosive, non-toxic, non-tainting, non-irritating, aldehyde-free disinfectant that has no adverse side effects on people, animals, or on equipment and surfaces. There is minimal chance of microbial resistance due to F10SC’s unique benzalkonium chloride and polyhexamethylene biguanide combination of actives and mode of action. In Australia, F10SC is registered by the APVMA for use in animal production and housing facilities, approved by AQIS for use in food export processing as a non-rinse disinfectant, and is also listed by the TGA as a Hospital Grade Disinfectant. *Rapid kill times – less than 30 secs for gram-positive bacteria, 60 secs for gram-negative bacteria, Canine Parvovirus 20 mins. Successfully tested against avian influenza (bird flu) viruses at a concentration of 1:500 in 10 mins. We use F10 for cleaning all our cages, aviaries, soaking bowls, nets and nestboxes. We also use F10 500ml Hand Gel when working between handling birds, hand feeding chicks, adjusting brooders and incubators. We highly recommend this product. The concentrate is diluted with water 1 part avi care in 50 parts water (20 mLs perLitre). At this dilution avi care performs to the "Hospital B" standards of disinfection. AVI CARE may be used on cages, perches, toys, food bowls, water containers, hand rearing equipment, incubators and brooders animal hospital areas, hospital cages, brooders and incubators. To maintain hygiene on these hard surfaces simply spray with avi care and rinse away excess. Allow to air dry. Sizes: Concenrate: 100mL, 500mL, 5L, 25L or a premade 500ml spray pack. Aristopet cage cleaner has been specifically designed for cleaning your birds’ cage and accessories including food and water bowls, toys and perches. This is an easy to use product which comes in a handy spray bottle for your convenience. The cage cleaner removes tough debris from cages and toys, leaving the cage clean and deodorised. Aristopet cage cleaner does not use masking perfumes the product actually cleans and deodorises the cage. Rufus & Coco Happy Hutch & Cage is a professionally formulated broad spectrum disinfectant spray that is quick and easy to use. Spray the affected area with Rufus & Coco Happy Hutch & Cage, then wipe down with a damp cloth. Then, wash off with clean water to remove any residue, and dry with a dry cloth before replacing fresh bedding. Now your little mate's home is sparkling. WARNING: Do not mix with other detergents or other chemicals. Do not use in septic systems.